I am very excited to present my new listing Downtown Squamish! Hello First-time Buyers and Investors! Welcome to Cleveland Courtyard, a boutique concrete building in the heart of Downtown Squamish! #304 is a move-in ready East facing end unit with breathtaking views of the Chief! Enjoy morning coffee or an evening BBQ with friends from your massive balcony. This 810 sq. 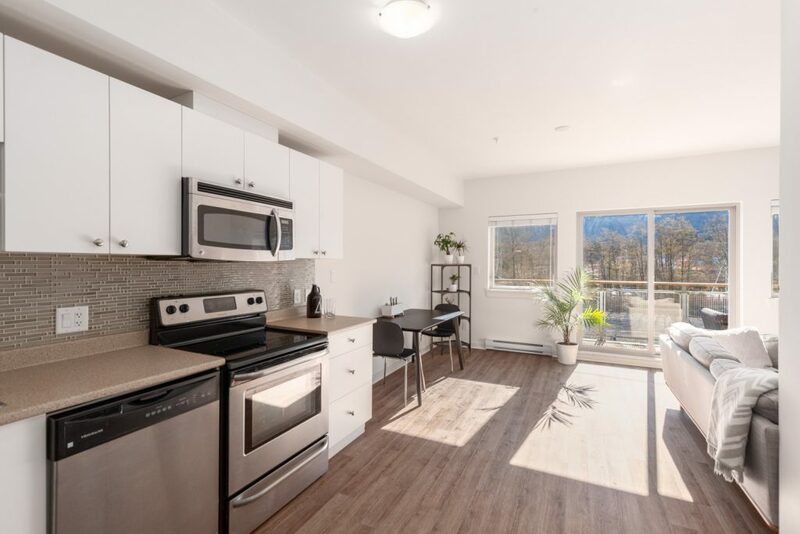 ft. 2 bedroom home (1 internal bedroom) offers privacy between the living area and master bedroom, over-height ceilings, tons of in-suite storage and in-suite laundry. Recent home updates include new laminate flooring. Stainless appliances, 1 secured parking stall + 1 oversized locker included. Located within walking distance of groceries, restaurants, cafes and breweries, this central location is hard to beat. Quick possession possible!